Since putting in our raised beds a few years ago we’ve tried a few different options for trellising our beans and peas. We were going for easy and not necessarily attractive. We certainly got “not necessarily attractive” and easy to put up, but unfortunately not easy to work with because they kept leaning and falling over. After last season Michael said he had some ideas and was going to rework the trellis, and I think he did a great job. It was easy to put together and looks nice in the garden, and it doesn’t lean. 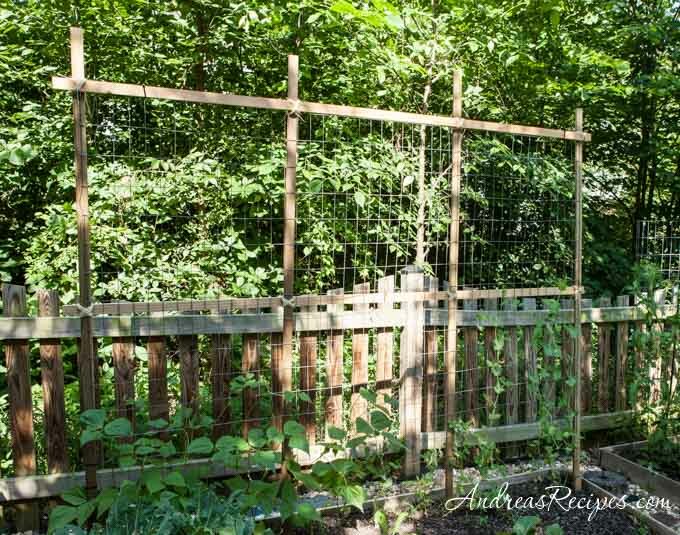 First he spaced the 4 vertical boards evenly apart, and to make the trellis as stable as possible, he drove them 2 feet deep into the ground. Then the two of us hung the horizontal boards using zip ties to hold them in place and checked them with a leveler. 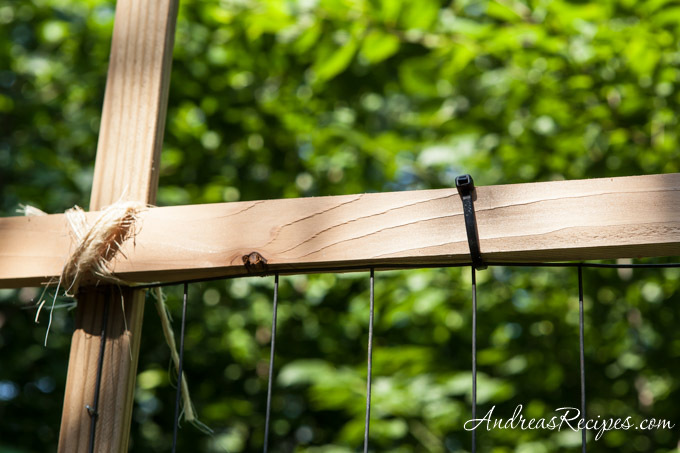 The top horizontal board is about 6 inches from the top of the vertical boards and hangs on the front. The middle horizontal board is hung approximately in the middle (we eyeballed it) and hung behind the vertical boards. Hanging the wire mesh fence takes a bit of patience because it’s rolled up, so the 5’x8’ cut piece has to be flattened before hanging. To get it up quickly, we used a couple zip ties at the ends to hold it in place, then used the staple gun to tack it into place on the vertical boards, then the middle horizontal board. It hangs about 6 inches above the ground, which is fine for the plants getting their start. 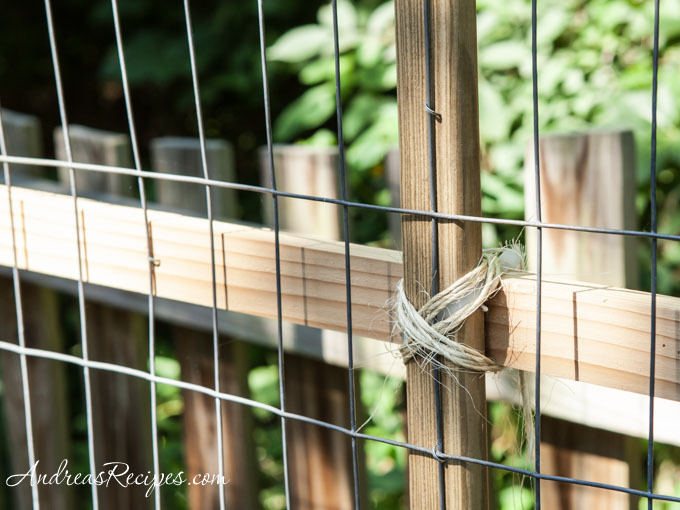 Because the zip ties don’t exactly look aesthetically pleasing, Michael lashed the joints with garden jute to cover the ties and give the trellis a more rustic look. And that’s all it took. No sawing required, just snipping the wire fencing. We started trailing the plants up the fence, and they are doing well. I call this project a win for the garden. Great project, and I think this trellis is quite aesthetically pleasing. Let’s hope for just the right balance of sun and rain this summer to help the garden grow! I can’t wait to have a garden! This project looks like so much fun!